Aquaponics is a rapidly growing sector of food production that merges aquaculture (fish farming) with hydroponics (plant production in nutrient-rich water). Fish in large tanks are fed daily. Their waste creates nutrient rich water which is pumped to grow beds to fertilize the plants. The plants take up these nutrients, cleaning the water. The water then returns to the fish tanks in a closed loop system. 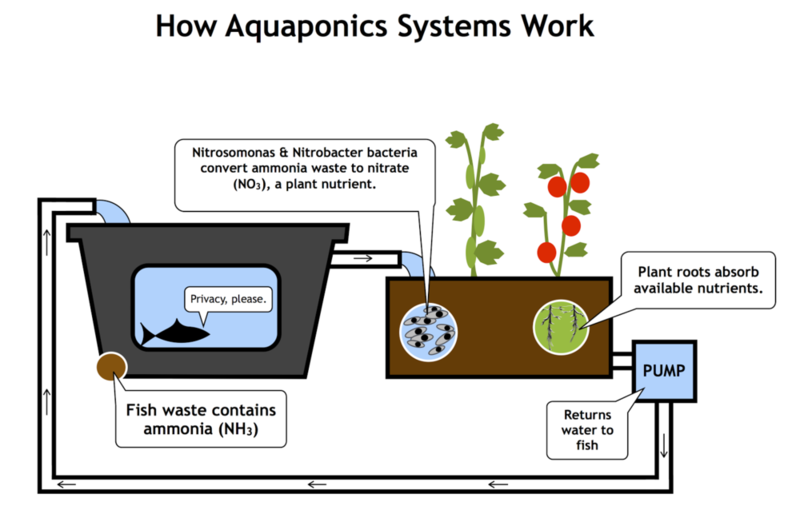 The magic of aquaponics is performed by bacteria. They convert toxic ammonia (NH3) into less toxic, nutritious Nitrates (NO3). A balanced ecosystem is achieved by closely mirroring natural processes. Typically, aquaculture has the burden of disposing of nutrient-rich run-off, while hydroponics has the burden of sourcing nutrients to feed the plant. The merging of these two techniques solves the problems of each. Aquaponics can grow up to 20 times the annual yield when compared to conventional agriculture. Greenhouses can be placed in communities where traditional gardens might not be practical. Farms that are closer to end user consumers saves on transportation and storage costs. Greenhouses provide extended growing seasons and a physical barrier to some pests, pathogens, climate hazards and vandalism.